Here is the list you have been waiting for: The 50-Fish-Stores-Tour Stores. Every one of us on this tour deserves a round of applause. The Local Fish Store is disappearing at a rapid rate and those of us that are left are mostly good ones. We have to be good because people need a reason, now more then ever, to shop with us. We have to be better, do better, be more creative, and be more passionate then ever. We are the ones who will stay open later if a customer has a fish problem or even come in on their day off just to make sure your fish survive. The big box stores and online retailers can’t do that for you. I understand the appeal of the online retailers. You can order online in your pajamas at 3 AM and get whatever you want delivered right to your door. There are also a lot of great little retailers selling coral online who probably have (or had) a local store and needed to go online to survive – those are the the good guys who got creative. I have bought things online as well, but when your return pump stops on a Saturday and you need one now, that online retailer you gave so much money to can’t help you, and when your fish gets sick and you need advice from someone who has been there and can recommend products that they know will work, those big box stores won’t have the answers you need to save your beloved fish. I am definitely not saying that you should cut off all online buying; it’s convenient, exciting, and fun to look at stuff at when you can’t sleep or just want to add something different to your aquarium. 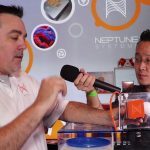 You can get amazing deals shipped right to your door, and sometimes, sites carry amazing corals or captive bred fish that your local fish store just doesn’t. I think there needs to be a balance. I know for a fact that my customers also shop online, they tell me everyday. But they also come in and buy from me because they trust me and what I do. They trust my knowledge ad my advice, and they trust me when I tell them how well we take care of our fish and corals. If everyone thinks about their local fish store a few more times every month instead of mindlessly jumping online, it would make for a more balanced world and keep the Local Fish Store going. Now back to the tour. 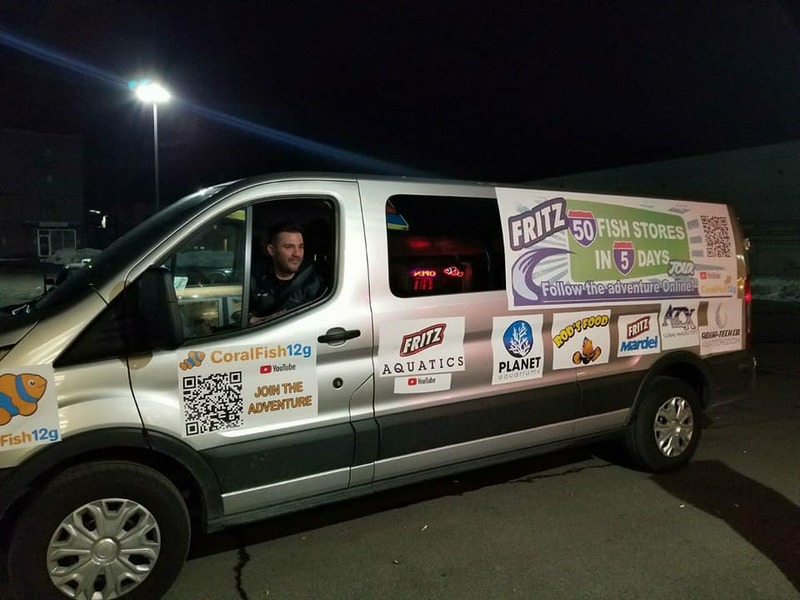 Here is the video of the 50 fish stores in 5 days tour east coast edition. 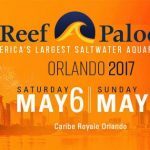 Please subscribe to the Coralfish12g youtube channel to get notified when the rest of the videos come out. George is taking a lot of time to make these epic videos to remind us why the Local Fish Store is so important. Its amazing to me that he took his spring break vacation to come on the tour and I think he did an outstanding job, but you should watch and see for yourself. If you live near any of these guys, go in and give them a chance to gain your trust. You may start to think of them first, and you’ll know that they will be there for you when you need them. 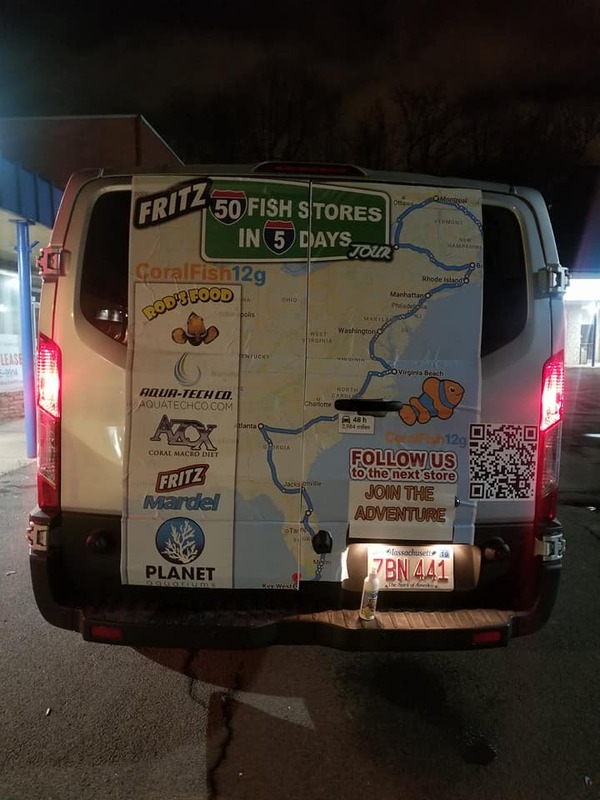 Here are the stores in the order that they were visited on the tour: #1-Easy Aquariums Gorham, Maine #2-Green Mountain Aquarium Inc Shelburne, Vermont #3-ABC Reefs Solvey, New York #4-Big Als Gloucester, ON Canada #5-Reef SolutionLaval, QC Canada#6-Aqua PlusMontreal, QC Canada#7-AquaRealmSt Johnsbury, Vermont#8-School Of FishSpringfield, Massachusetts#9-Aqua DreamsFeeding Hills, Massachusetts#10-Wet Pets EmporiumVernon, Connecticut#11-Colchester Pet ShopColchester, Connecticut#12-Ocean State AquaticsCoventry, Rhode Island#13-Credabel Coral GalleryNew London, Connecticut#14-Greenwich AquariaRiverside, Connecticut#15-House of FinsGreenwich, Connecticut#16-Gills Aquarium StoreMamaroneck, New York#17-The Reef ShoppeBronx, New York#18-Long Island Aquarium/Reef GenRiverhead, New York#19-Brian’s Tropical FishRocky Point, New York#20-Aqua HutCoram, New York#21-Country Critters LtdPatchogue, New York#22-Caribbean Blue Aquatics IncBay Shore, New York#23-Aquarium VillageWestbury, New York#24-Manhattan AquariumsNew York, New York#25-The Fish Hut New JerseySaddle Brook, New Jersey#26-Absolutely FishClifton, New Jersey#27-Sea Level AquariumPine Brook, New Jersey#28-Ocean GalleryPlainfield, New Jersey#29-REEFCOGreen Brook, New Jersey#30-Fitz’s Fish PondsBound Brook, New Jersey#31-AquaridiseEast Brunswich, New Jersey#32-Aquarium Care CenterOcean Township, New Jersey#33-Tropiquarium Ocean Township, New Jersey#34-The Hidden ReefLevittown, Pennsylvania#35-Fish FactoryBristol, Pennsylvania#36-Mini ReefProspect Park, Pennsylvania#37-Supreme Reefs Springfield, Virginia #38-Aquariums UnlimitedVirginia Beach, Virginia#39-The Fish Room Raleigh, North Carolina#40-Fintastic Aquariums of Wake CountyCary, North Carolina#41-Triad Reef Critters Greensboro, North Carolina#42-Carolina Aquatics Kernersville, North Carolina#43-Greendale Tropical & SaltwaterKannapolis, North Carolina#44-Upscale AquaticsHuntersville, North Carolina#45-Nemo’s Reef Matthews, North Carolina#46-AquaticaCharlotte, North Carolina#47-Oceans Floor LLC Greenville, South Carolina#48-Aquarium Outfitters Athens, Georgia#49-Premier AquaticsMarietta, Georgia#50-Top Shelf AquaticsWinter Park, Florida#51-Living Reef OrlandoOrlando, Florida#52-World Wide CoralOrlando, Florida#53- Sea Life AquariumApopka, Florida#54-Nahackeys AquariumMelbourne, Florida#55-Fintastic Aquarium Jensen Beach, Florida#56-Rileys ReefJupiter, Florida#57-Tanks A Lot AquariumsLake Worth, Florida#58-AP FragsBoca Raton, Florida#59-Barrier Reef Boca Raton, Florida#60-Hydra AquaticsDania Beach, Florida Thanks for being on this journey with us! 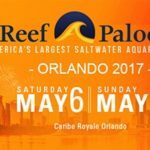 What is your favorite local fish store? Jen owns a local fish store called Colchester Pet in CT where aquaculture is the future. 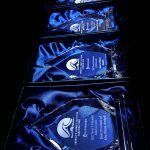 She is always fundraising for aquaculture and raising awareness through her blogs. 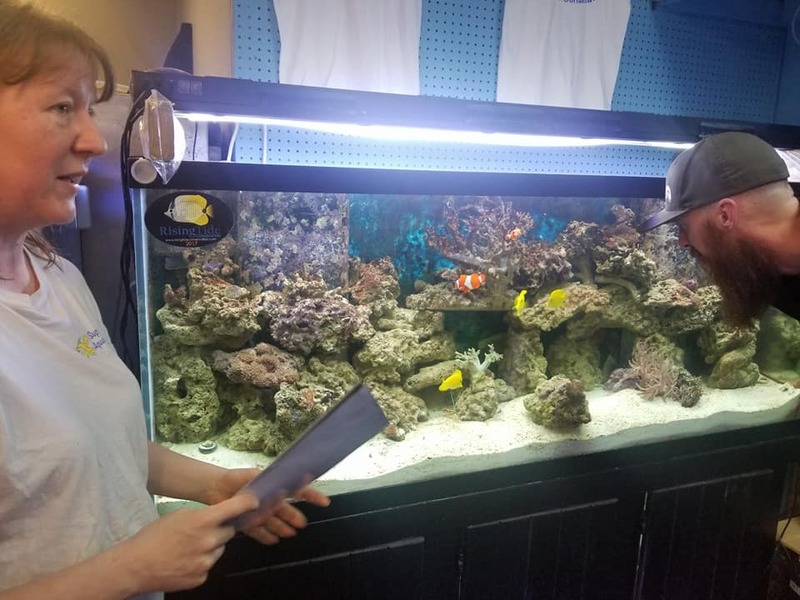 She is also aquaculture obsessed and has many species of aqua cultured fish including three of the first aquacultured Yellow Tangs and the Famous Tango the Tang (one of the first aquacultured Pacific Blue Tangs). She is very passionate about the hobby and wants fish to Thrive not just Survive.